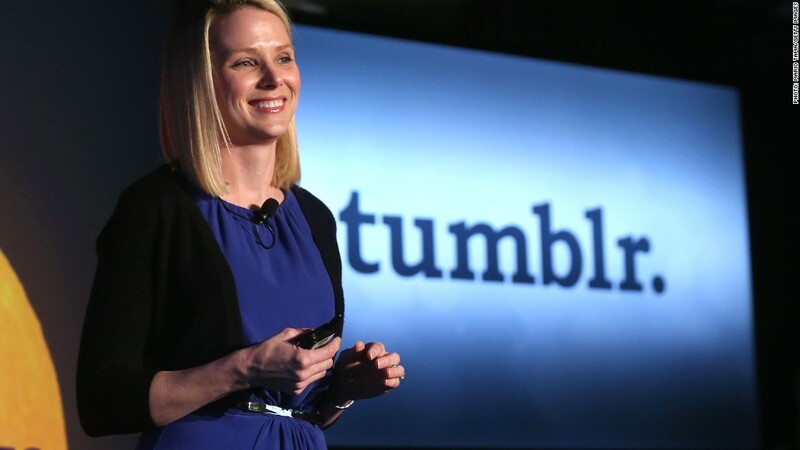 Mere hours after announcing Yahoo will buy blogging site Tumblr, Marissa Mayer unveiled a revamped Flickr photo-sharing site. The Internet asked Marissa Mayer to "please make Flickr awesome again," and in turn, the Yahoo CEO is revamping her company's photo-sharing service. The redesign is a complete overhaul of Flickr's previous text-and-white-space layout, with a focus on larger, full-bleed images. The new Flickr homepage offers "endless scrolling," a la Pinterest and features huge photos on the left side of the page, with smaller pictures and social options on the right. Personal photo pages also got a revamp that focuses on big images. Photos won't lose any fidelity when they're uploaded and shared, and all Flickr users now get a whopping one terabyte of storage, which is more than 537,000 photos. Yahoo (YHOO) also released a new Android app, following an Apple (AAPL) iOS release in December. "Flickr didn't fare so well" after Yahoo acquired it in 2005, Mayer admitted. Both ex-employees and users complained the company wasn't putting enough development resources into Flickr. The once hot service seemed destined to be on Yahoo's dreaded "sunsetting" lists. As soon as Mayer became CEO last July, "save Flickr" campaigns popped up, beseeching her to help. "Thank you, Internet, for being so awesome," said Adam Cahan, Yahoo's senior vice president of product and mobile. "That was a call to action for us." "Marissa asked us to completely re-imagine Flickr," Cahan added later during the event, a splashy but relatively small affair at a hotel in New York City's Times Square. Photos papered the walls, sat under floral centerpieces and flashed across TV screens. Yahoo also announced it will take over the former New York Times building in Times Square, and all 500 New York Yahoo employees will be now be housed in one office. New York City Mayor Michael Bloomberg spoke briefly. He joked about how "yahoos" -- that is, prostitutes -- once clogged up Times Square, "but now we'll have Yahoos making an honest living." Yahoo announced Monday's event the Friday before, one day after tech blog AllThingsD reported the company was close to a buyout of blogging site Tumblr. Speculation was high that Monday's event would focus on Tumblr, but Yahoo ended up announcing the $1.1 billion deal in the morning. "Did Yahoo buy Tumblr just to get us to come to an event for Flickr?" BetaBeat journalist Kelly Faircloth tweeted. During a post-event Q&A, most journalists' questions focused on Tumblr. Mayer was eager to focus on Flickr, but said her company doesn't "intend to" limit or censor content on Tumblr.